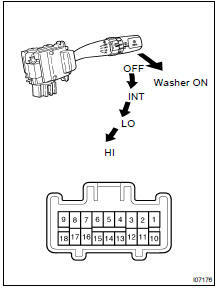 (a) Turn the wiper switch to INT position. 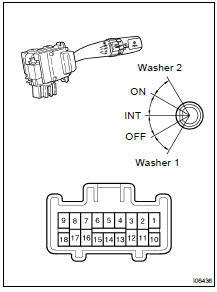 (b) Turn the intermittent time control switch to FAST position. (c) Connect the positive (+) lead from the battery to terminal 16 and the negative (-) lead to terminal 2. (d) Connect the positive (+) lead from the voltmeter to terminal 7 and the negative (-) lead to terminal 2, check that the meter needle indicates battery voltage. 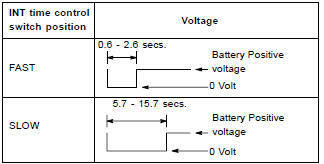 (e) After connecting terminal 16 to terminal 17, connect to terminal 2 to terminal 17, check the voltage rises from 0 volts to battery voltage within the times, as shown in the table. 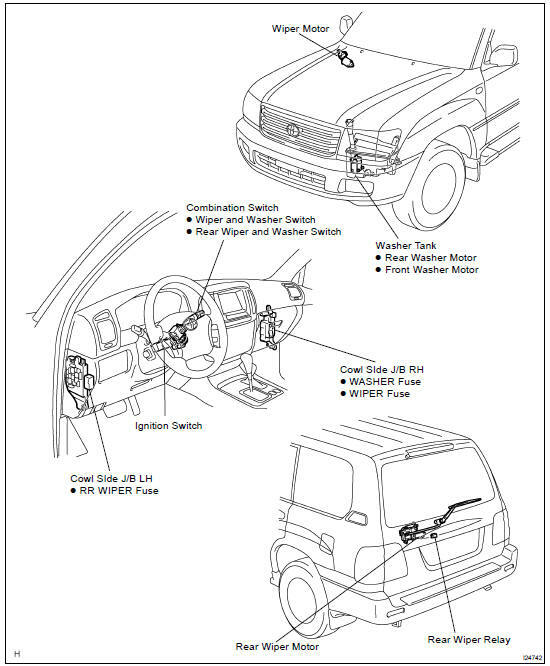 If operation is not as specified, replace the wiper and washer switch. Connect the positive (+) lead from the battery to terminal 1 and the negative (-) lead to terminal 5, check that the motor operates at low speed. If operation is not as specified, replace the motor. Connect the positive (+) lead from the battery to terminal 4 and the negative (-) lead to terminal 5, check that the motor operates at high speed. (a) Operate the motor at low speed and stop the motor operation anywhere except at the stop position by disconnecting positive (+) lead from terminal 1. (b) Connect terminals 1 and 3. (c) Connect the positive (+) lead from the battery to terminal 2 and negative (-) lead to terminal 5, check that the motor stops running at the stop position after the motor operates again. Connect the positive (+) lead from the battery to terminal 2 and the negative (-) lead to terminal 1, check that the motor operates. Connect the positive (+) lead from the battery to terminal 3 and negative (-) lead to terminal 2, check that the motor operates at low speed. (a) Operate the motor at low speed and stop the motor operation anywhere except at the stop position by disconnecting positive (+) lead from terminal 3. (b) Connect terminals 3 and 4. (c) Connect the positive (+) lead from the battery to terminal 1 and negative (-) lead to terminal 2, check that the motor stops running at the stop position after the motor operates again. NOTICE: These tests must be performed quickly (within 20 seconds) to prevent the coil from burning out.